In the TECHNI repository, content showcasing 6 decades of cultural activities of Thessaloniki are available and in the Historical Archive of Greek Refugees HAGR, there is archival material relating to the large wave of refugees following the Asia Minor Catastrophe and the Treaty of Population Exchange. In its relationship with regional bodies to provide them with repository services for the exploitation of valuable digital content locally collected, EKT presents two new repositories: the Macedonian Art Society TECHNI and the Historical Archive of Greek Refugees. Both are repositories of organisations from Thessaloniki which showcase and highlight aspects of the city’s cultural output. The repository service enables content providers to organise and to make their digital material available on modern online platforms which highlight and widely disseminate it. To date, there are 182 documents showcasing 6 decades of the city's cultural activities in the TECHNI repository, the Macedonian Art Society. TECHNI Macedonia Art Society, founded in 1951 in post-war Thessaloniki, brought together the city's intellectual and artistic forces with the common goal of developing art and literature. The repository endeavours to highlight the cultural output of the city through the intellect and work of pioneering leaders of its cultural life. The content enables the researcher to explore the intellectual life and the personalities active in creating the cultural institutions which have characterised Thessaloniki for the past 6 decades and, in fact, still do so. The archive is populated by key personalities such as Pavlos Zannas, the writer and grandson of Penelope Delta, the archaeologist Manolis Andronikos, the architect Dimitris Fatouros and many more academics, innovators and cultural activists who have contributed to its development, showing their passion for the city and its culture. The archive can be browsed by title, creator, date, subject or key-words and is organised into collections and sub-collections such as Events,Training and Techniques and interesting educational digital applications for children, TECHNI's Permanent Collections, which include a small but interesting collection of paintings, etchings and musical instruments, Publications, among which is the most important art journal for the city, ' Art in Thessaloniki' and finally a collection of material from the Peiramatiki Skini tis Technis. This emblematic institution was founded in 1979 by the Macedonian Art Society on the initiative of the theatreologist Nikiforos Papandreou. It holds a particularly significant place in the archive and the repository has a wealth of material, for example, programmes from more than 200 plays and other events, the 'Theatrika Tetradia', issues dedicated to writers of plays featured in 'Peiramatiki Skini tis Technis' etc. Enrichment of the repository is ongoing with the addition of further documents from the TECHNI archives for arts, architecture and literature. The Municipality of Kalamarias incorporates, documents and presents archive material relating to the large wave of refugees following the Asia Minor Catastrophy and the Treaty of Population Exchange from the Black Sea (Pontus), Asia Minor and Eastern Thrace. There are oral first generation refugee testaments and remarkable archival and photographic material consisting of public records and private collections is being added. So far, 4,805 documents have been incorporated. Records from public services include administrative, educational and church documents, while private collections refer to the private and public life of the Greek refugees both in their places of origin as well as their new homes in Kalamarias, Thessaloniki. The repository also contains maps from the Historical Archive of Greek Refugees of the Municipality of Kalamarias and Press collections. In addition to the two repositories mentioned above, EKT has begun collaboration with the Teloglion Fine Arts Foundation and the School of Fine Arts, Aristotle University of Thessaloniki. This collaboration will provide three more repositories for art collections and archival materials from the foundation and the School of Fine Arts. It will also bring the number of partners the National Documentation Centre has in Thessaloniki to 50. 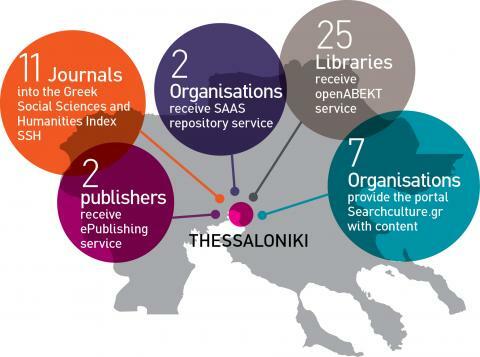 There are 2 publishers already receiving its ePublishing Service, 11 journals from Thessaloniki have been incorporated into the Greek Social Sciences and Humanities Index SSH, 7 organisations provide the portal Searchculture.gr with content and 25 libraries receive the openABEKT service, an integrated cloud-based service for catalogues and library functions. 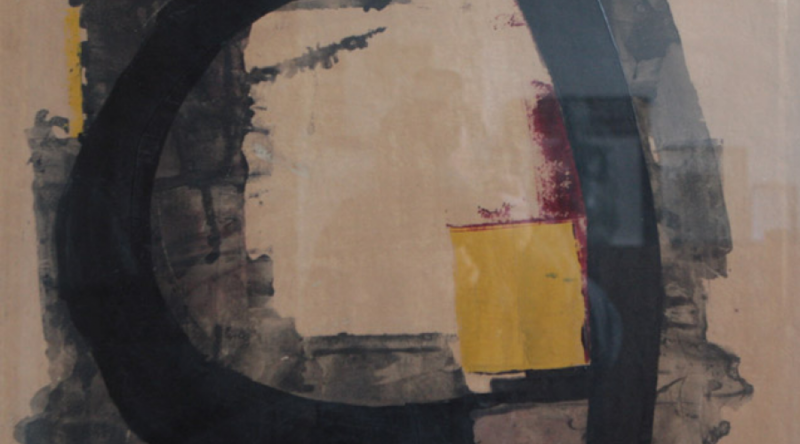 The painting is from the collection of the TECHNI Repository (Sotiris Zervopoulos, "Without Title" 1967) and you can see it here.